Losing weight is always a struggle, it requires a huge amount of willpower and discipline, plus plenty of exercise to make the difference. Getting started is often the hardest part, once you are in a routine and notice the changes, things become a whole lot easier. But how to get started? A little inspiration goes a long way. To demonstrate exactly what can be done with the right approach, we here at Bored Panda have compiled another list of inspiring transformations of those who have been there, done that. You can check out our previous posts here and here if you just can't get enough. These people have changed so much, it's hard to believe they are the same person! Scroll down below to check them out for yourself, and let us know what you think in the comments! No one said there would be math! Looking great! MY GOD people, the tattoo did NOT move....in the 2nd pic he is taking the pic in a mirror, probably one of the wall-to-wall mirrors in a gym...notice his right hand is not in the frame....b/c it has a phone/camera in it taking the photo. SMH. Thank you for not hiding the extra skin. It's a real thing and you still look amazing! Off-topic: A tiny infinty was achieved with the phones and mirrors. #10 104,2 Lbs Down. Started In 3XL, Today I'm Wearing M Top And S Trousers! Looks a completely different person........... Wow. You look beautiful! Way to go! I love the panda tattoo as well as the amazing change you made! Both are spectacular! And he had his 3rd hand removed!! What is VSG and CICO? 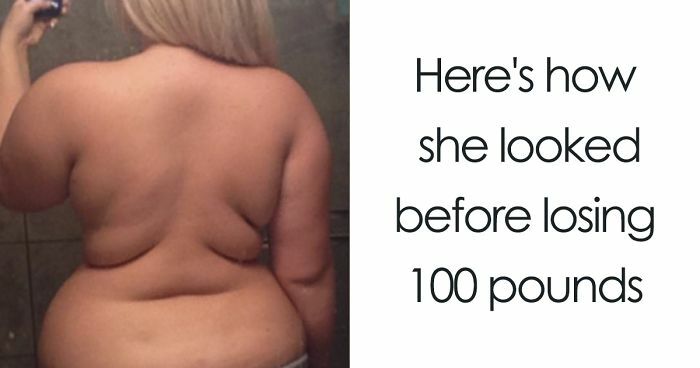 Pretty in both photos, but as well as the weight loss, she's taken so many years of her appearance... Congratulations!!! #18 110 Lbs Lost In 18 Months. Unmotivated Couch Potato To Australian Ninja Warrior And 4x World Champs Obstacle Course Racer. Loving Life Now! 18 months? I’ll think of you when I’m low on motivation, sir. Great job, you look amazing! #21 Set A Goal 2 Years Ago To Lose 100 Lbs By My Bday And I Did It! Keep up the good work! Looking great! #26 40 Lbs In 4 Months. Feeling Like A Brand New Person And Smiling A Lot More! Not only a beautiful woman, but obviously a smart one, as well. Like her t-shirt says, vaccines cause adults, not autism like some quacks want to make you believe. Your dad looks great, but the best thing about both pics is how your mom looks at him, true love! You can do it, just remember what it is like to carry all the extra weight around. How your body aches from the extra weight. I have faith in you, you can keep going. You look like your own daugther now! Changes in the faces (of all of these people) are the most fascinating to watch, for me. Love the dress and smile! Not only have you lost weight, but girl you've got muscles! Good job! Looks a lot more than 72kg. Keep going man! Love the hair color change too! Looking fabulous. Congrats. You don't look 199 lbs. You must be tall. OMG you guys are great!! #48 Lost 310 Lbs. Have Never Felt Better! Please send me your workout regimen. He’s so handsomenin all his pics! And your wake got smaller too! You're still pretty, no matter what. And now you have two fitting pencil skirts instead of one big shorts. #60 Lsot 90 Lbs. Weight Loss Progress In 18 Months. Not Only That, I Overcame A Host Of Mental Health Issues And Lifestyle Diseases And Reclaimed My Life In 18 Months! You look like a star, shining and sparkling now! Buffed up. Looks good to me! Much happier and looking fit! THE BIIIIIIIIIIIIIIIIIIIIIIIIIIIIIG SHOOOOOOOOOOOOOOOOOOOOOOOOOOOOOOOOOOOOOOOOOOOOOOOOOOOOOOOOOOOW!!! I LOVED THAT GUY!! Look very good and much younger!